-8 Piece Wine Lovers Themed Charm Set - Eight unique shapes to show off your love of wine. What is included with the 8 Piece Wine Lovers Charm Set? Don't lose track whose glass that is. We all know that they can look the same. 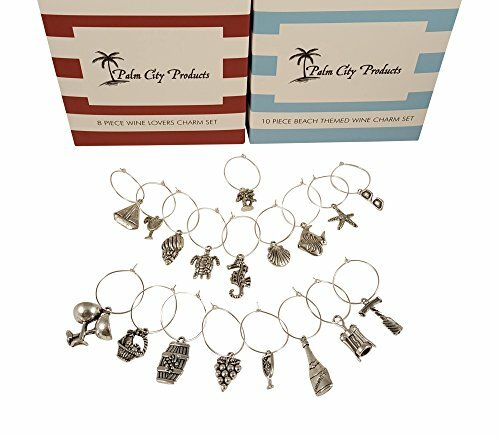 This bundle contains two separate sets and eighteen unique shaped charms. Have enough shapes for enjoying a glass by yourself or when hosting larger dinner parties. 8 Piece Wine Lovers Themed Charm Set - Eight unique shapes to show off your love of wine. If you have any questions about this product by Palm City Products, contact us by completing and submitting the form below. If you are looking for a specif part number, please include it with your message.